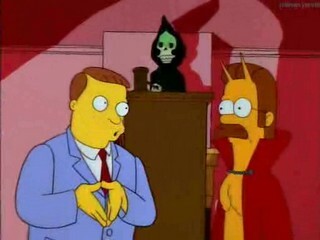 "The Devil and Homer Simpson" (Homer sells his soul for a donut), "Terror at 5 1/2 Feet" (Bart is menaced by a gremlin on the school bus) and "Bart Simpson's Dracula" (Bart is turned into a vampire by Mr. Burns). In a parody of Night Gallery, Bart introduces a series of paintings which inspire horrific stories. This is the last episode of the show Conan O'Brien worked on for the show (he primarily worked on the framing sequence). It is also the last Treehouse episode to feature a framing sequence uniting the three segments (a framing sequence was written for the next Treehouse episode, but was cut to give the actual segments more time; the tradition was never revived after that). Though the Halloween episode are considered non-canonical, this episode marks the first appearance of German-exchange student Uter, who will appear in other, non-Halloween episodes. "Terror at 5 1/2 Feet" is another segment directly inspired by a specific Twilight Zone episode, this time "Nightmare at 20,000 Feet", starring William Shatner. Kang and Kodos annual Treehouse appearance occurs in that sketch, when they discover the gremlin tormenting Bart to be attacking their ship. In addition to all the film and TV references sprinkled throughout this episode, the very ending is a spoof on A Charlie Brown Christmas. Devil Flanders' Jury of the Damned consists of Benedict Arnold, Lizzie Borden, Richard Nixon (who wasn't dead at the time), John Wilkes Booth, Blackbeard the Pirate, John Dillinger, and the starting line of the 1976 Philadelphia Flyers. Mr. Burns: Hmm...who's that goat-legged fellow? I like the cut of his jib. 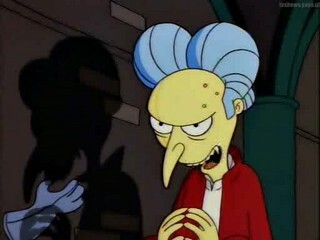 Smithers: Er, the Prince of Darkness, sir. He's your eleven o'clock. Blackbeard: Arr, 'tis some kind of treasure map! Benedict Arnold: You idiot! You can't read. Blackbeard: Aye, 'tis true. My debauchery was my way of compensatin'! Groundskeeper Willy: Me mule wouldn't walk in the mud. So I had to put seventeen bullets in 'im! Homer: Aah! They're dogs...and they're playing poker! Kent Brockman: Another local peasant has been found dead -- drained of his blood with two teeth marks on his throat. This black cape was found on the scene. Police are baffled. Homer: Oh, Lisa, you and your stories. "Bart is a vampire." "Beer kills brain cells." Now let's go back to that...building...thingy, where our beds and TV...is. Lisa: The only way to get Bart back is to kill the head vampire: Mr. Burns! Homer: Kill my boss? Do I dare to live out the American dream? Two of the three segments from this episode made my list of favorite "Treehouse" segment, both in the top five, at that. The lone segment out was the Bart/gremlin one, a perfectly funny piece that gets points for introducing German exchange student Utter, but doesn't quite rise to the level of the segments surrounding it (truth be told, having watched this since I was kid, everyone's refusal to believe Bart, despite that being the source of humor and being lifted directly from the source material, has always kinda rankled me). "The Devil and Homer Simpson" succeeds thanks to the novelty of Flanders-as-the-Devil, the inclusion of Lionel Hutz, and the various Homer in Hell sequences. It is quite simply packed full of great gags and lines. "Bart Simpson's Dracula", while almost as funny in its own right, also succeeds as a pitch-perfect parody of not only Bram Stoker's Dracula but vampire movies in general, making it a perfect ending for one of the series best Halloween episodes. 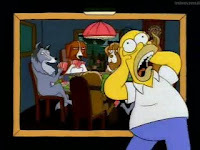 Also, you can see in this episode the transistion in the show from Bart to Homer as the series' central character. Though Homer has already risen to prominence this season (two of this season's four episodes have been Homer-centric), he and Bart each headline their own segment in this episode and, despite the title, largely share the focus of the third. Compare this to next season's Treehouse episode (including the famous "Shinning" segment), in which Homer is the focus of two segments, while Bart is relegated to sharing the third with Lisa, and it's even more clear that Homer's star is on the rise. Each segment in this episode can make a case for being an all time classic, combining for yet another all-time great Treehouse episode. The framing sequence (the last one used for the show's Halloween episodes) isn't quite as Halloween-y as past efforts, but there's still a general aura of horror and creepiness to these segments which fit the holiday. Torturer: So, you like donuts, eh? Torturer: Well, have all the donuts in the world! I forgot that Homer found a loop hole in the Devil's plan by not eating the entire donut...until he did. This was a really great episode. Not much more to say about it except The Simpsons really was on fire during this period. @Dr. Bitz: I forgot that Homer found a loop hole in the Devil's plan by not eating the entire donut...until he did. And that's what really sells the bit: that Homer is smart enough to find the loophole, but not smart enough to lock the donut up or safely dispose of it, instead just leaving it in the fridge.